Last month, Rob Neil accompanied the last ever passenger flights by Singapore Airlines’ Boeing 747s—SQ747 and SQ748 from Singapore–Hong Kong–Singapore. 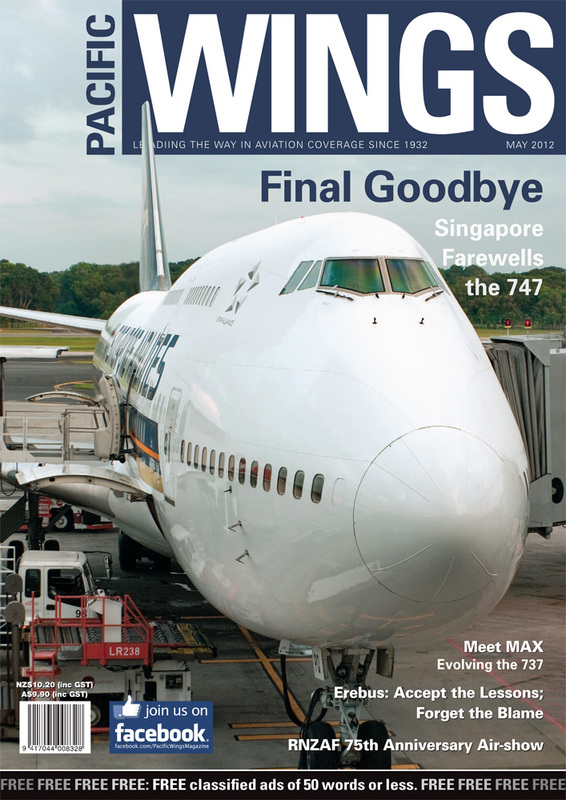 Rob reports on the flights and the celebrations, while Rudi van der Zwaal looks back nostalgically on his experience as a Singapore Airlines B747 pilot. Images from the spectacular RNZAF 75th Anniversary Air-show at Ohakea. So, You Want to be an Air New Zealand Pilot? Part two of a five-part series of articles. Christine Ody continues her series of articles on what it takes to become an Air New Zealand pilot. Christine Ody, who flies Boeing 737s, flew to Sydney last month to hear the presentation by Joe Ozimek—Boeing’s head of marketing for the 737 MAX programme—about the new 737 MAX aircraft. Paul Sortehaug continues his series of articles on New Zealand’s air aces with the story of Capt. Ronald Burns Bannerman. Captain Gary Parata is a current airline pilot and highly experienced flight instructor, as well as an accredited air accident investigator and flight recorder specialist with the New Zealand Airline Pilots’ Association and International Federations of Airline Pilots’ Associations; he is also a member of the International Society of Air Safety Investigators. He arguably presents the definitive overview and summary of the Erebus tragedy and its aftermath.